As we reported last month, we exceeded 100K registered users on our platform out of which 40% shared their valuable skincare profile information. We have now exceeded 114K and the numbers keep growing. In response to the great traction, we are pre-announcing today Opu Brand Connect which will enable skincare brands, marketers and researchers to gather valuable information from consumers while providing rewards in the form of Opu Coin. We have started signing up marketing partners for the service and will be making announcements over the next few weeks. The target date for the Opu Brand Connect launch is October 1st so stay tuned! The first challenge using these new features will be offered by our team. 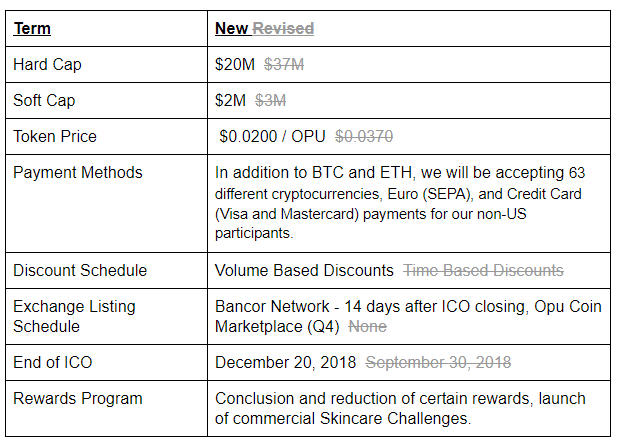 Opu Labs Skincare Challenge #1 is a tailored Airdrop which will consist of 35,000,000 OPUs awarded to users who have completed their Opu skincare profile and who participate in a rigorous skincare product test using Opu Labs tools. Eligible participants can earn a minimum of 2000 OPUs for the completion of the defined tasks with additional bonuses available for users who go above and beyond the baseline tasks. Opu Labs will post the kickoff of this challenge on our social media in the coming weeks. All skincare enthusiasts are welcome and we encourage you to refer your friends to earn additional Opu Coins;-)! Last month we also posted about our plan to give liquidity directly to ICO holders of OPU coin. Since then, these plans have significantly advanced. We are now looking to integrate this functionality into the Opu Coin Marketplace. The Opu Coin Marketplace will be a user friendly storefront where consumers and marketers purchase OPUs in order to use them within the network or for other purchases. Our ICO Participants will be able to place orders with their earned and purchased OPUs within the Opu Coin Marketplace in order to sell them directly to the OPU internal market as an alternative to secondary exchanges. With this system in place, the Opu Network will become a major acquirer of Opu Coins going forward. Opu Labs has entered into an agreement with the Bancor Network to list OPU after the completion of our ICO. The Bancor Protocol provides an on-chain, fully decentralized solution for continuous conversion between tokens through a low-cost, perpetual, algorithmic and adjustable liquidity mechanism. 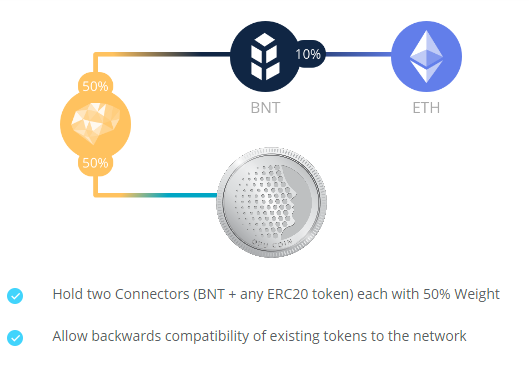 Bancor compliant tokens are called​ Smart Tokens, and connect to form the Bancor Network​ for​ decentralized liquidity​. Bancor’s smart token platform is a great fit for OPU and we plan to connect the Opu Coin Marketplace to the network. We will be extending our token sale to the TokenDesk Platform. TokenDesk is a direct token marketplace for FIAT and cryptocurrency crowdfunding, giving investors a technical solution to purchase Initial Coin Offerings Tokens in a faster, safer and more reliable way. TokenDesk simplifies the purchasing process by providing a single platform where participating ICOs are listed in one place, as well as offering expert‘s help to evaluate the ICOs. We will be adding the TokenDesk widget to our home page and purchasers outside of the US and Japan will be allowed to purchase tokens on our site as well as on TokenDesk’s portal. The original hard cap of $37M was determined after looking at our extended 4–5 year budget in line with recent blockchain industry practices. Conversely, the softcap was set to be in line with market launching a full minimally viable product. Given the continued progress of our development efforts combined with better than expected user registrations, we believe that lowering both the hard and soft caps to $20M and $2M respectively is appropriate. Additionally, these lowered caps will directly contribute to price stability and lowered volatility post-ICO. With respect to the ICO closing schedule, we understand that many of our Opu Rewards and Airdrop participants are anxious for us to close the ICO and distribute the tokens. However, after looking at the recent performance of many ICOs on the market, we believe it is in the best interest of everyone involved to continue to build real value in parallel to conducting the token sale. For this reason, it is mandatory that we extend the sale until the end of the year. These combined updates make Opu Coin ever more attractive — real commercial service launches, adoptions ahead of expectations, and serious solutions for token liquidity and price stability. As one of the primary holders of OPUs, Opu Labs is very excited about the recent updates and prospects. For users such as yourself, the time to participate is now! Please join us by purchasing your OPUs directly at http://ico.opu.ai.